James is an Associate Professor of Information and Computing Sciences and discipline lead for Interactive Media Design at Bond University, where he runs the Mixed Reality Research Lab (www.mixedrealityresearch.com). His research spans computer science and visual arts, with an emphasis on applied design and development of interactive mixed reality (virtual reality, augmented reality, 3d printing, mobile) experiences assisting learning, skills acquisition and knowledge discovery. 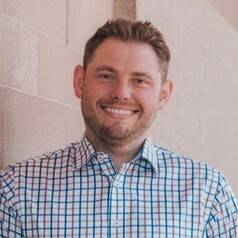 The distinctive contribution James brings to education scholarship is in digital media teaching and learning, where he received a 2014 Australian Office of Learning and Teaching citation for outstanding contributions to student learning. James utilises novel pedagogical approaches, curriculum and resources to balance the science and art predilections of his students, whilst supporting them with learning how to learn. His service to the university and wider community has formed around his experience in emerging technology, teaching and learning. Where he takes an active role in supporting learners and peers through mentorship, presentations and expert judging.